I logged on last night to a flurry of activity. Apparently, our esteemed space dictator Bahamut420 had gotten it into his head that a massive Amarr fleet was coming to take out our little POS (which was coming out of reinforced) in Kourmonen and was gathering many, many things in preparation. 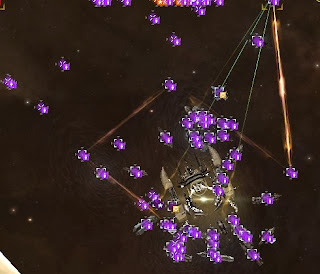 It is a very rare evening in the life of Late Night Alliance where battleships and triage archons are called for. We poked Wex in our super secret channel. Wex used to be a Late Nighter but moved up to Molden Heath to join 7-2. He started rousing his corpmates, and got a small group of them to carrier jump down with ships in their hold to join us. And Gritz went over to have a chat with Biohazard to see what they could bring. I was getting a little nervous at this point. I don’t want to be ‘that’ alliance. You know…the one that calls in tons of help, only to have nothing to kill. I was scanning various locals on my alt, and checking to see which Amarr FCs were online, and it wasn’t looking good. I was convinced we were about to batphone all our friends to an uneventful tea party at a worthless small POS. It turned out Biohazard had lots of people online, and not a whole lot to do. So we ended up switching to their fleet. When all was said and done, they pretty much tripled out fleet, growing it to well over 50 pilots or more at that point. For the Minmatar, this is a bit rare for a fleet –people see that many people in fleet and their eyes start to glaze over and their soul starts dying a little inside. Altean of 7-2 then agreed to take over the battleship fleet, since Biohazard would not be on field initially, and Bahamut was Archon #2. Our fleet was heavy, but didn’t really look too scary. We had maybe 10-12 Battleships between LNA and 7-2. And that is when things took an interesting turn. I haven’t flown under Altean a whole lot, but I personally think it’s a sign of a good FC when they can think on their feet, and make quick decisions in situations that are quickly changing. However, I wasn’t entirely sure about the ‘scaring Shadow Cartel’ tactic…and I could tell by the sound of his voice he wasn’t entirely convinced it would work either. After all, it’s Shadow Cartel….not…Fweddit or something. Making scary faces and running at them while waving our arms and making bird noises probably won’t work the same way it does with most of the Amarr. Granted, I don’t know SC all that well but they strike me as the type that is not easily scared off by a bunch of crazy Minmatar Militia. However, there were few other options left to us unless we want to feed them a free BS kill. So in we went. And out went our Sentries. “We’re going to need reps.” Altean said, fairly soon after attacking them. Ishtar drones hurt! Wex’s cyno went up, and a split second before he exploded into scrap metal, our first archon arrived and immediately went into triage. The time line is fuzzy at this point, but for some reason the second archon was also called in. Our secondary cyno announced second cyno up, and Bahamut jumped in with his archon, and triaged. Now, this is the point in the fight where you can usually tell what’s going to go down. When people see triage on field, they do one of two things. They stick around, keeping the triage+fleet entertained while preparing their counter drop, or they go away because there’s no hope to DPS through 2 triaged archons. But you can hope that you’re going to take some things down with you. And this is when the Amarr decided to arrive. Better late than never. In particular, it was Fweddit in a large cruiser+augoror fleet. turning things into an itneresting three-way. It only took a couple minutes, and a few dead cruisers, for Fweddit to realize they were outclassed in this fight. They ran away pretty quickly, with their tail between their legs. Shortly after the Amarr left, Shadow Cartel lit their own cyno. Well, we were expecting that. “You want us in?” asked the Biohazard fleet. At this point, we had LNA and 7-2 on field, with 2 triage carriers. And about 25+ Biohazard armor battleships sitting on a titan several jumps away chomping at the bit to get in on the fight. Now, at this point of the story, I have to admit that usually in my experience the roles are reversed. Usually, an enemy cyno is up, and battleships and scary things are coming through it to kill us. So, to have the deafening sound of dozens of friendly battleships coming through a titan bridge to land on three hostile, sieged dreads, was a beautiful and unusual sound. I didn’t even mind the slight hiccup in my guns and other things not responding as the system lagged out for a split second as we filled local with Minmatar Militia. Local was now over 100 pilots. At this point, the Biohazard FC took over, calling dps targets and neuting targets. With all the neuts we had on field, it was not long before the first Moros was completed cap dry. Unfortunately, we still lost both our archons. But Shadow Cartel went away with three less dreads. ...another awesome fight with the kings of low-sec. Great write up of the battle report! http://www.youtube.com/watch?v=yWlbuwFU398 , the video from the fight (maybe nice to add into the report. second archon came in early because i glitched out andf couldnt lock.